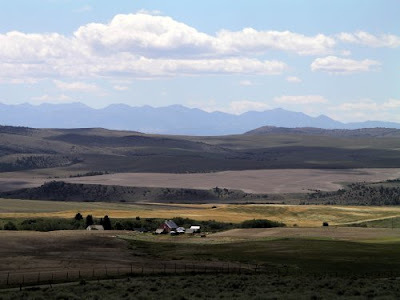 Today's photo is a shot of my very favorite part of Gallatin County ... the far north end of the Gallatin Valley, still a land of big farms and one-room schoolhouses and amazing views. The trophy homes have barely encroached up here, though I'm sure it'll happen someday. One more post about Vachel Lindsay before we move on. Though Lindsay was best known as a poet, he was also a pretty interesting graphic artist, and many of his published poems were accompanied by some fairly intriguing line art. 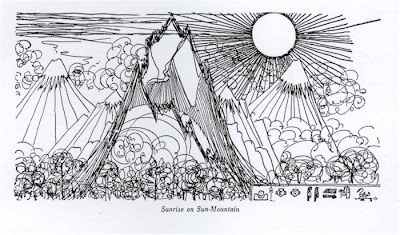 The drawing below, from Lindsay's 1923 book Going-to-the-Sun, is a good example of his visual style. I think it's pretty cool, although from looking at it you might think that Glacier Park has volcanoes! I imagine that only the English majors reading this have heard of someone named Vachel Lindsay ... but back in the 1910s he was one of America's best-known poets. He was as much a troubadour as anything, really, wandering the country and reading his poems aloud to eager audiences. 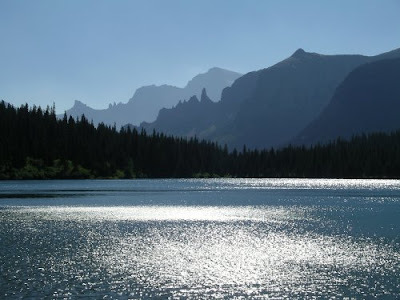 In the early 1920s Lindsay and a friend paid a visit to Glacier Park. He fell in love with the place instantly, of course, and the result was a 1923 volume of poetry and art called Going-to-the-Sun. Lindsay decided that he liked this part of the world so much that he moved into the Davenport Hotel in Spokane the next year, and a sequel called Going-to-the-Stars was published in 1926. The books weren't well-received, though ... the American public had apparently decided that Lindsay's style had become passé. He ended it all in 1931 by drinking a bottle of Lysol. Round the mountain peak called "Going-to-the-Sun,"
And let us guess which ones were good to eat. Or rattled dead twigs like a fairy's bones. And dragged us to the chalet, and the tourists' resting hall. He'd beat the door to call us forth again. So among other places, yesterday's roadtrip took me to the tiny town of Martinsdale, Montana ... a place that's home to one of the most unique (and under-visited) museums in the state. The Bair Family Museum is a sprawling, eccentric building that was once home to one of Montana's most prosperous sheep ranchers. The Bair daughters spent decades filling the house with original art and eighteenth-century French furniture ... and when the last of the ladies died the home became an endowed museum. The place has struggled -- Martinsdale is too remote to draw many visitors, and some of the big-city trustees tried to shut the house down and pirate everything off to the evil city of Billings. The Montana Supreme Court finally had to step in, but now there's hope that the family's legacy will be honored and the museum will survive. It's a fascinating place, and I highly recommend a visit. If you don't head up there today, though, you'll only have one more chance on Wednesday before the museum closes for the winter. But with luck, they'll open up again next May. I'm heading out for a drive this morning ... there's no better way to de-stress, and besides, this could be one of the last really warm days of the year. So in honor of that, here's another roadtrip photo. 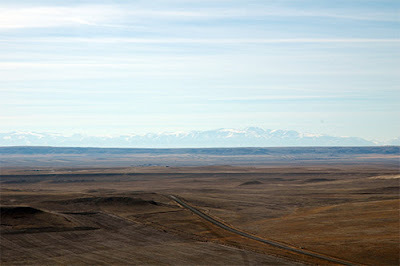 I shot this last April -- it's US 2 a little west of Browning, and those mountains in the distance are part of Glacier park. Those of us who have just a little bit of seniority on this planet can remember when pretty much every small town had a building that had the community's name painted on its roof in huge yellow letters. The signs were relics of the early years of aviation ... in the days before radio (much less GPS), confused pilots could look down on those painted roofs to figure out where the heck they were. They were called "air markers," and most of them dated from the 1930s. The air markers weren't just limited to towns, though ... some of them were far out in the middle of nowhere, in case a pilot happened to get really lost. Many of them included navigational tips that were written in a little language all their own. Like this one, which still exists on the roof of an old cattle shed in the upper Smith River country in northwestern Meagher County. The code is actually pretty easy to decipher. The arrow on the left of course points the direction to Helena, which is 35 air miles away. The symbol on the right directs one to the nearest airfield ... in this case, the one at White Sulphur Springs, which is 21 miles to the south. And the numbers in the center are the latitude and longitude of the cattle shed, separated by a north arrow. I know its unfair to use a black-and-white photo to illustrate this point, but in the prairies of eastern Montana there are times with the earth and the sky and the works of man all fade into a blurred monochrome, and the landscape seems to be without distinction. This is especially true in the early spring, after the snow has melted but before the land has started to return to life. This is photo of the little McCone County town of Circle ... certainly not one of the more dramatic spots in our state. The shot was taken back in March 1942 by a federal photographer working for something called the Office of War Information -- whatever that was. The cowboys had lived for months under the great bowl of the sky, and yet the Montana skies seemed deeper than the skies of Texas or Nebraska. Their depth and blueness robbed even the sun of its harsh force -- it seemed smaller, in the vastness, and the whole sky no longer turned white at noon as it had in the lower plains. Always, somewhere to the north, there was a swath of blueness, with white cloads floating in it like petals in a pond. 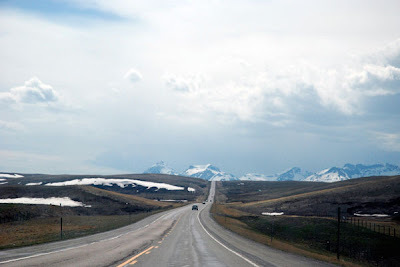 I know I've said this before, but I think some of the finest views in Montana are along the eastern edge of the Rocky Mountain front ... the line where the mountains and the plains meet. 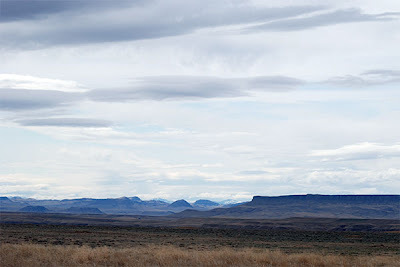 I took this shot at Ulm Pishkun a couple of years ago, looking past the last of the prairie buttes towards the high country to the west. So far we've had a gorgeous September here in Montana -- warm, sunny days and really pleasant nights -- but I'm seeing more and more signs that those days are numbered. I had to turn the furnace on this morning, and tomorrow's the first day of autumn ... and this morning the most spectacular part of the Going-to-the-Sun Road closed down for the year. 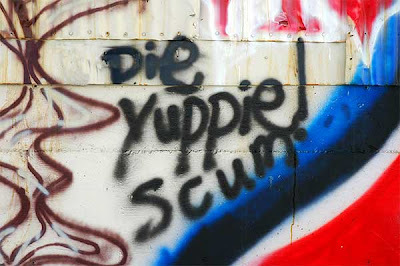 Today's photo is just a quick shot of some graffiti I found in Bozeman a few years ago. Apparently we have yuppies! Back in 1908, a Philadelphia department store magnate named Rodman Wanamaker sponsored a photographic expedition to Montana, intended to document scenes of traditional Native American life before it disappeared forever. The lead photographer on the project was a man named Joseph K. Dixon, and he and his staff managed to capture some of the most evocative images of the American Indian ever taken. The best of the photos were later published in a book called The Vanishing Race, which is a real collectors item today. This image is one from the collection. 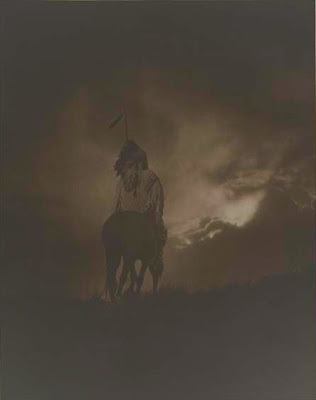 It's titled, "The Sunset of a Dying Race," and was likely photographed somewhere in what is now Big Horn County. Today's photo is an historic shot that I think is very evocative. 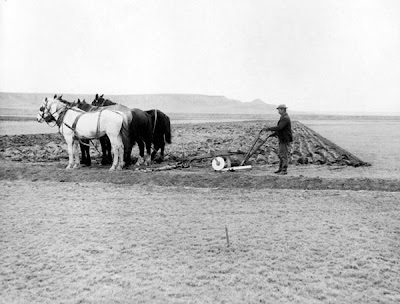 It's titled "Turning over first sod on homestead," and it was taken outside of Sun River by William J. Lubkin on November 5, 1908. 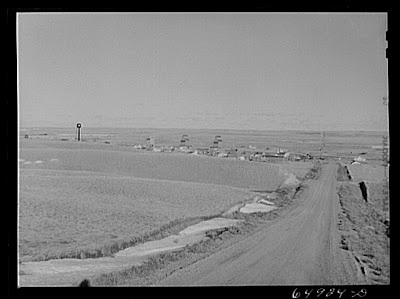 Lubkin was an itinerant photographer working for the U.S. Bureau of Reclamation, and probably took this photo while documenting the construction of the Sun River Irrigation Project. My last lyrics quote here mentioned that Missoula is almost certainly the most-musically-mentioned city in the state. I'd guess that Bozeman is number 2 in that regard ... the city's got a musical tradition of its own, and a name almost as evocative as Missoula's. Butte might be next on the list, even though its name evokes a set of entirely different images. To show what I mean, here's the opening stanza from an entertaining song called "Butte, Montana," by Hank Green. It's available on YouTube, as well as his 2009 album So Jokes. You likely won't be surprised to hear that Mr. Green lives in Missoula, rather than Butte. It’s filled with lead and arsenic. 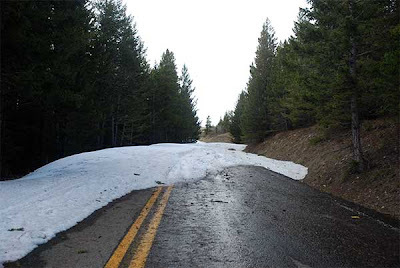 Since yesterday's photo was a shot of a backroad way into Montana, I thought today I'd give you a photo of a backroad way out. This is a photo I took a few weeks ago of the international boundary between the U.S. and Canada ... I'm standing in Montana, and the land on the other side of that gate is part of British Columbia. 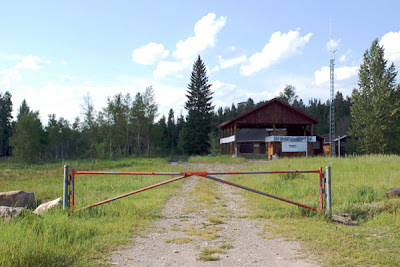 This is the old Trail Creek port of entry, just west of Glacier Park on the North Fork of the Flathead. The crossing was permanently shut down back in the mid-90s, but as you can see from the road the level of traffic was never extensive. The old buildings in the background served as the port of entry into Canada. I used this port of entry once, back in the 80s. Got there in early afternoon, and my car was the first one of the day. There's always something kind of cool about crossing a state line while you're on a roadtrip ... it's not quite an international frontier, but it's close enough. On the major highways, of course, the state-line signs are all glossy and professional, the products of ad agencies and tourism promotion boards ... but out on the backroads things are nearly always less polished, and therefore more interesting. Ever the fan of useless trivia, I was randomly wondering last week which of Montana's place names has had the most songs written about it. Though I haven't done a full-blown study of the issue, my guess is that the winner is probably Missoula ... not only is the town a bastion of the creative arts, but the word "Missoula" is itself thoroughly evocative and lyrical. 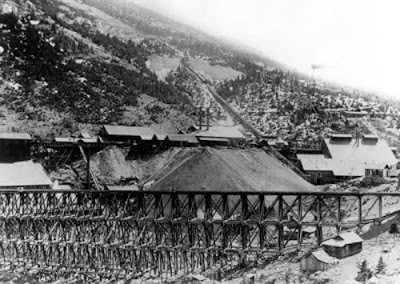 Today's photo is an historic image of one of Montana's most legendary mines ... the Drumlummon, located at the great old ghost town of Marysville, in the mountains north of Helena. Discovered by a prospector named Tommy Cruse in 1876 and named for his hometown in Ireland, the mine produced silver and an estimated $50,000,000 worth of gold, most of it back in the 1880s. Everything in this scene is long gone now, of course, but today a Canadian mining firm is spending millions in an attempt to reopen the mine. Apparently, there's a lot of valuable ore still down there. We're all familiar with the "State Quarters" program sponsored by the US Mint for the last decade, and most of us also remember the Montana entry in that series: a design featuring a Charlie Russell-style bison skull. It's an icon that Montanans understand, but that left a lot of other people scratching their heads (or feeling creeped out, for that matter). I thought we should have put Glacier Park on our quarter, instead. Well, yesterday the Mint announced the details of its new "National Sites" quarter program, which will include designs featuring a National Park or other important site from each of the states. Montana's choice was a no-brainer, of course, and so in 2011 Glacier Park will finally receive its due and be featured on a US Quarter. And the news gives me a chance to post another gratuitous Glacier photo here. 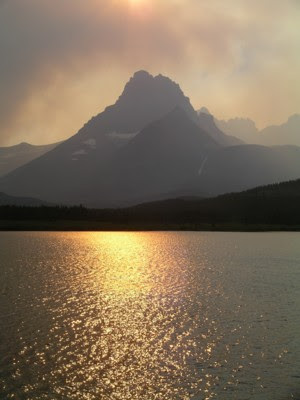 I took this shot in the Many Glacier valley in the summer of 2003 ... the orange haze is from a huge forest fire that was burning on the other side of the Garden Wall. We've probably all heard a hundred songs with Montana lyrics in them by now ... but for most of us the ones that stick are the ones we remember from our youth. And though a little part of me hates to admit it, Frank Zappa's "Montana" is definitely one of those songs for me. Right before my first summer job in Glacier Park I was attending college in Utah, of all places ... and when I started telling people where I was going I received a long string of snarky comments about dental-floss ranching in return. I had absolutely no idea what they were talking about at first -- bit I did before long. 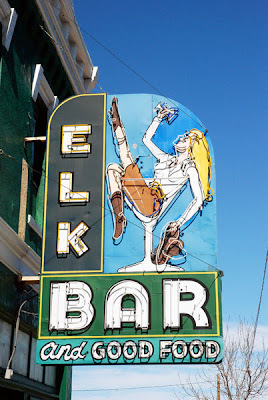 Even though I've never seen this sign after dark, I'm still willing to bet that it's one of the greatest bits of neon in the state. And I found it in what was for me, at least, a most unexpected place: the little Hi-Line town of Chinook! Who would have thought? Since today is Labor Day, I decided that I should post a picture of people who were laboring ... so here's an old Forest Service photo of CCC enrollees chopping firewood. 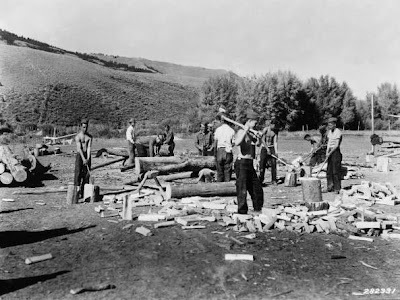 This was taken at the Ruby CCC camp on the Beaverhead National Forest, presumably down in southwestern Madison County. 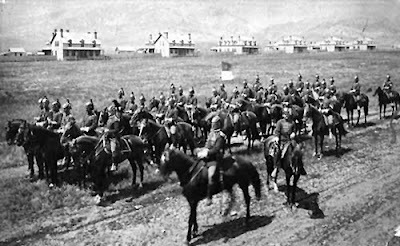 The United States Army had a very strong presence in Montana during the last third of the nineteenth century, in large part a military response to the Custer massacre of 1876. Scattered across much of the territory, the Army's forts were busy and often well-built places ... but most of them also had fairly short lives. 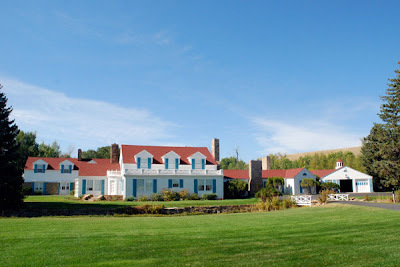 One of the lesser-known Montana posts was Fort Maginnis, situated in a remote but lovely ranching area a little southeast of the Judith Mountains in Fergus County. The fort was established in 1880 and abandoned a decade later, as Montana's perceived "Indian threat" rapidly faded. There's almost nothing left at the site today, except the old post cemetery ... though the military burials there were exhumed ages ago. This evocative old photo of Fort Maginnis dates from 1886. The buildings in the background are Officer's Quarters, built using standard military blueprints of the era. 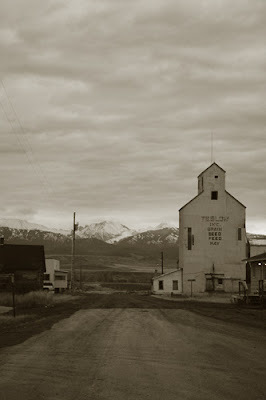 There's no doubt that Montana has one of the strongest literary traditions of any of the states, and it's one that extends back all the way to our frontier era. One of my favorite Montana authors from a century ago is a man named Frank Bird Linderman ... a fine storyteller and artist who lived on the Hi-Line and in the Flathead Lake country. His books are filled with wonderfully evocative tales of Montana's Native Americans and frontiersmen. Today's entry is a sentimental poem by Linderman, printed as an introduction to his 1920 book On A Passing Frontier: Sketches from the Northwest. The volume is dedicated "to the good town of Malta, and to the camps in the Little Rockies where the old west is making it's last stand." A wealth of stories never told. Are blotting you from human sight. Eternity will tread on us. Just one more Glacier photo before we move on ... at least for a while. This is Lake Frances, my favorite backcountry camping spot on the Brown Pass trail, up near the Canadian line. I took this photo about six years ago while on a backpacking trip with two friends up into the Hole in the Wall country ... and though the little lake was freezing, of course I took a morning dip. I've been trying very hard not to overwhelm this blog with photos of Glacier Park, despite my inclinations to the contrary ... but I suppose a few more Glacier shots won't hurt. 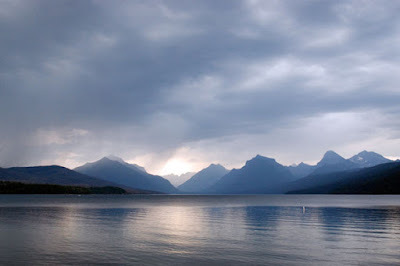 I took this one back in July, an evening shot of Lake McDonald taken from the beach at Apgar. Most beautiful vista in the world. Today's quote is from a piece called "Cecil Migrates," by an author named Ellen Meloy; it was published in the 1988 volume Montana Spaces. Meloy was a naturalist, writer, and artist who moved to Montana in the 1970s for graduate school, and stayed for over a decade before emigrating to the canyon country of southeastern Utah. 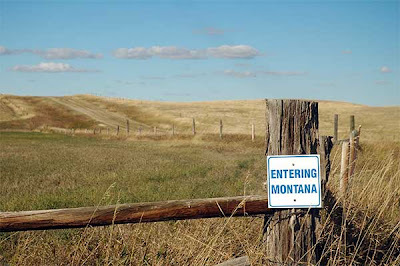 Before Alaska came along and ruined everything, one of every twenty-five square miles in America was Montanan. This much space has nurtured a healthy Cult of Place in which people find perfection, even divinity in the landscape; they finally admit that here man and earth are in the right proportion to one another. One of the things I love most about Montana landscapes is the dramatic interplay you often see between the prairies and the mountains. This is a shot I took a few years ago while driving through the Big Coulee country, near the Stillwater-Golden Valley county line. The prairie goes on as far as the eye can see ... but way off in the hazy distance, the Beartooths still loom over everything.